This co-location approach could prove especially useful in sunny, arid regions such as the southwestern United States where water is scarce, said Sujith Ravi, who is conducting postdoctoral research with professors David Lobell and Chris Field, both on faculty in environmental Earth system science and senior fellows at the Stanford Woods Institute for the Environment. "Co-located solar-biofuel systems could be a novel strategy for generating two forms of energy from uncultivable lands: electricity from solar infrastructure and easily transportable liquid fuel from biofuel cultivation," said Ravi, the lead author of a new study published in a recent issue of the journal Environmental Science & Technology that details the idea. Computer simulations of a hypothetical co-location solar farm in Southern California's San Bernardino County by Ravi and colleagues suggest that these two factors together could lead to a reduction in the overall amount of water that solar farms need to operate. "It could be a win-win situation," Ravi said. "Water is already limited in many areas and could be a major constraint in the future. This approach could allow us to produce energy and agriculture with the same water." But which crops to use? 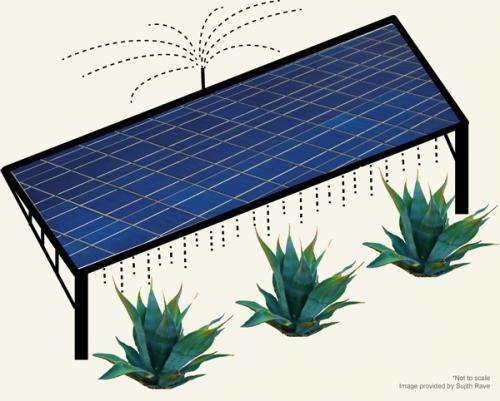 Many solar farms operate in sunny but arid regions that are inhospitable to most food crops. But there is one valuable plant that thrives at high temperatures and in poor soil: agave. Native to North and South America, the prickly plant can be used to produce liquid ethanol, a biofuel that can be mixed with gasoline or used to power ethanol vehicles. "Unlike corn or other grains, most of the agave plant can be converted to ethanol," Ravi said. "Sujith's work is a great example of how thinking beyond a single challenge like water or food or energy sometimes leads to creative solutions," said Lobell, who is a coauthor on the new study. "Of course, creative solutions don't always work in the real world, but this one at least seems worthy of much more exploration." Biofuels aren't the only use for agave-derived ethanol. An alternate product that is both popular and profitable is known locally as "tequila". :)) exacly my thought !